Heather Giustino Blog: Fabulous Giveaway with The TomKat Studio!! Fabulous Giveaway with The TomKat Studio!! Happy Thursday, everyone! Today I am so excited to be sharing an amazing feature on one of my very favorite people, who happens to run one of my very favorite shops. Kim Stoegbauer needs NO introduction - she's the fabulous woman behind The TomKat Studio, and someone I'm lucky to call a friend. Kim's blog was the very first one I started following and her etsy shop was the first one I ever "favorited" (is it weird that I remember that?) 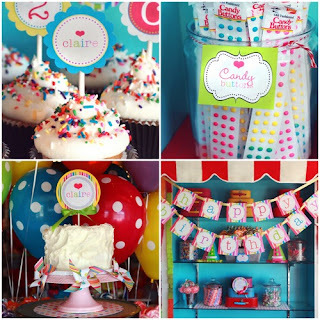 Her daughter, Kate's lollipop party was the inspiration behind Leila's Sweet Shoppe party, and I've been following Kim's fabulous advice ever since! 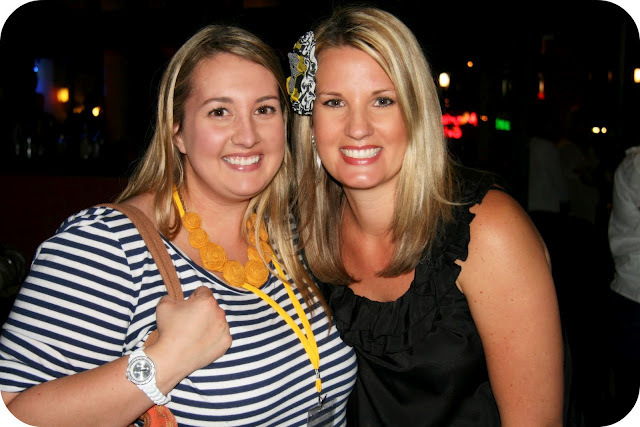 So, before we get to the amazing giveaway, let's learn more about Kim, shall we? In 2008, I left my career in real estate to stay home with my two little ones, Tommy & Kate (TomKat). 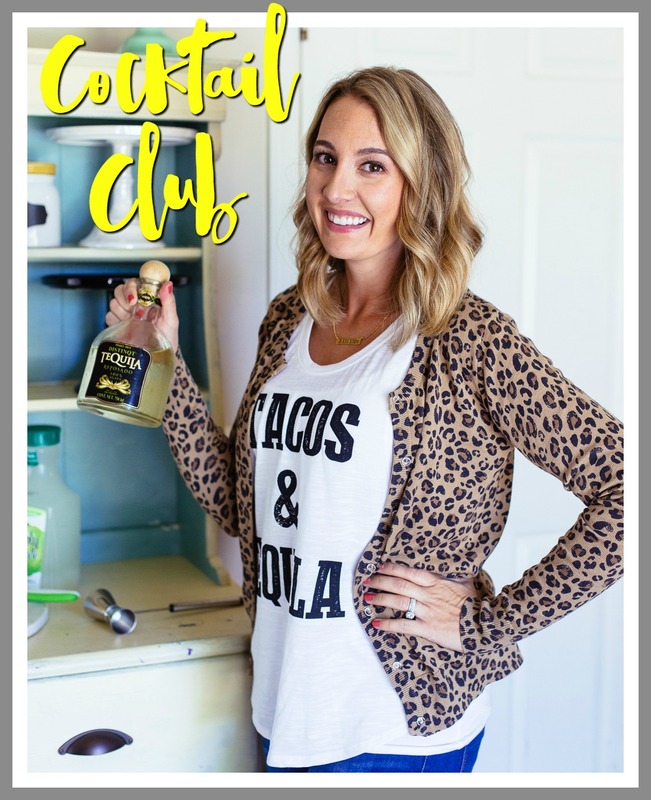 I started my blog as a creative outlet to share projects that I was working on, whether it was home decorating, remodeling projects, parties, baking and crafts. A couple months later, after I posted my daughter's BIRTHDAY PARTY, I began receiving requests from readers to sell the items I had made for her party. On a whim, I decided to open up shop and I haven't been able to keep up since! I never imagined that I would or could create a business out of the passion I have for parties. 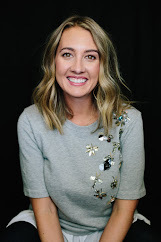 I couldn't be happier doing what I love, styling and designing parties and shoots now not only for my own shop, but for incredible brands like HGTV and Pottery Barn Kids. My blog gives me an incredible platform to share new ideas, projects and products with my fabulous readers. Their support and encouragement is what keeps me excited each day and motivates me to keep creating! Not gonna lie - I'm kind of jealous that I can't enter this giveaway, it is that amazing. Kim is generously offering one of you the chance to win not only an adorable 6" pink cake plate, but also a $50 store credit!!! Told you it was good!!! I know you *really* want to win, so I'm going to give you lots of chances - just use the rafflecopter below. Good luck! I would use the $50 certificate for straws, berry baskets, balloons, and anything and everything else I could get my hands on. I love The TomKat Studio! 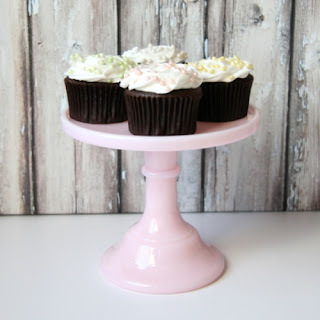 Love the cake plate and have been eyeing lots of stuff in the TomKat shop! Thanks for a great giveaway! I hope i win..its so awesome! id probably use it on stuff for pey's second birthday...which, yes, is 7 months away. I'd throw a party for my son or husband or maybe even a baby shower! Such cute things and ideas! I'd bake a cake to see how pretty and delicious it looks on the platter and throw a party! Her shop has such cute items and ideas it's going to be hard to choose if I win! I would probably use it on paper goods for my sons birthday! I love all of her stuff but my daughter wants to do a sleepover and I am thinking the Movie Night theme would be great! What a fun giveaway! I love Kim and her shop! I'd use my certificate to get some paper straws, and some baking cups. Oh man do I have to pick something it is all sooooooooo yummy!! I love it all! You are right Heather great give away! I love the cake stand and I believe I would use the gift certificate on her great party supply packages. My twins turn 13 in late summer! 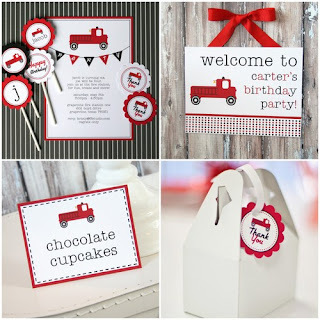 I would love to buy some goodies from TomKat Studio to plan an awesome birthday. 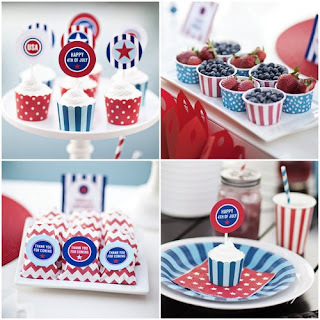 I would buy the 4th of July printable party collection! I would buy giant balloons! I absolutely love the whimsy they bring to any event! I would use it to buy party items for a summer gathering with some close girlfriends! Honestly, I have no idea! I would figure something out though. It's fabulous! 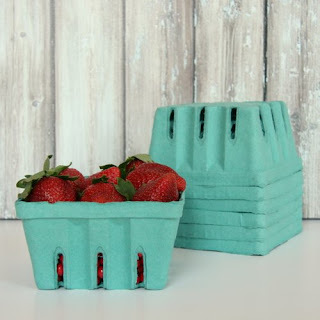 I would buy some berry baskets to use for gifts for the future! Wow, such amazing sets to pick from!! I love the 4th of July theme but I would figure out which one is my fav if I was lucky enough to win!! :) Such great and fun ideas!! So cute. Cake balls would be so cute displayed on this. Hello, I'm catarina and well let's see I would spent it all on wedding supplies and decor for my wedding. I'm getting married in August. I actually just purchased a few things today! I would have a hard time deciding because I have three grands that love parties, etc. I'm up for the challenge! If I won, I would use the gift card to purchase another cake stand...my mom LOVES them!! I would use it for the next birthday party...or just buy lots of gumballs for me! Oh my I would buy baskets, ballons, treat bags,and a lot more! If I won, I'd stock up on cupcake supplies! I would use the $50 gift certificate to purchase items for my son's 5th birthday in August. He's the baby and starting school in the fall, so we're planning a big party for him. 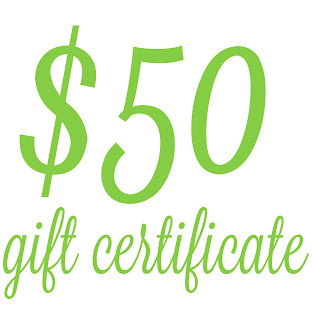 My son's first birthday is coming up, and I would love to use the $50 on stuff for his party! I would use the gift card on goods for my daughter's 2nd Bday party and to stock up on supplies for a wedding dessert table! I would stock up on paper straw, baking cups, favor bags and those candy and gumball tubes! I love the cake plate! I would use the $50 for my son and daughter's birthday parties! I would use the gift certificate on another cake stand!! I would use the certificate for another cake stand!! I would buy supplies for my sons Mickey party and my daughters owl birthday party! I would buy goodies for my cupcake business! We're having our 16th anniversary party this summer and I'd use the $50 for party supplies!!! cake plates, and baking cups, and baskets - oh my! love it all! fabulous giveaway! Love the stand. If I win...there is another stand that I have my eye on! Another cake plate! Love theses!!! Oh mY gosh that's the sweetest cake plate ever! and the blog is pretty cool too! Thanks for a chance at the plate! Love this cake plate! So excited! Can't wait to win--I'm feeling lucky! I'm in love with that cake plate! I adore my white ones, but have been wanting a colored one that will still match many occasions, and I think that one is perfect! With the $50, I'd snag some punches and lots of paper straws! I've been wanting to try using those as cake pop (or other treat pop) sticks for awhile, but haven't ordered any yet! I love me some TomKat studio!! and thanks to them, I now know about you! Yea!! I would buy the Fourth of July set. Makes for a fun and easy party! What a great giveaway- hope I win!!! I can't even imagine what I'd spend it on. I *think* I'd choose another cake plate. They are a little addictive! love this giveaway! I'm throwing a baby shower for a friend soon, I could get almost everything I need for the shower! paper straws, berry baskets, cupcake papers.. ohhh excited! I would LOVE to get some coordinating straws, plates, napkins, etc!!! I LOVE all of the stuff that Kim has to offer! I love the 4th of July package. It's my birthday (a "big" one that also has a 4 in it!) and it would be fun to celebrate with all that great stuff. I have two birthday parties and a bridal shower to plan this summer, so probably a variety of paper medallions and her gorgeous paper tableware products! I would love to use this giveaway for my friends bridal shower! I already have tons of themes in mind after seeing your post! I would use it for my daughters first birthday party! If I win, I'll be getting some punches and twine. Thanks for the chance! I would have to compile a collection of little blue favor bags straws and treat boxes for my son's birthday party. They would make perfect additions to the party I'm planning! If I won I would get more vintage party products, love them ! The 4th of july set would be so festive and fun! i'd probably get one of the cupcake stands...everything is so cute, though. I have 4 kids- so any printables would rock for their birthdays! Straws and baloons are awesome too! I would get the cupcake decorating kit and some sprinkles!! I have loved her shop forever! I would use it to buy goodies for my little one's third birthday party. Oh man I could spend this credit in like a nanosecond! I have no idea what I would spend it on but I already know it would be fabulous what ever it was! I would get a cupcake stand. I don't have one! Can you believe it?